under-ripe honey dew, restrain sweetness, juicy and watery. Grassy. Not quite there to match the finesse of the aroma. F- Medium, wood coating and warming. Pleasant, layers with subtle dried fruit and spice, lack depth. 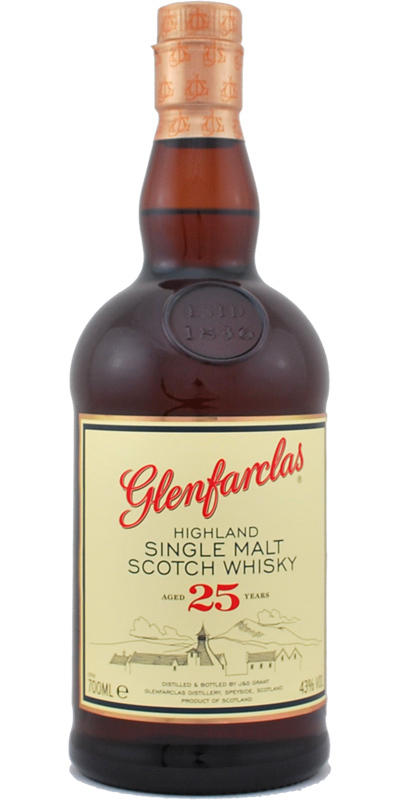 Great whisky, certainly not the best 25 in the world, but the one with the best PLV for this age and still <100 € almost unbeatable. hidden flavours of this dram. It wouldn't surprise me if the price would rise (March 26th 2016= €105). Tasting done with and without adding water.There are better whisky's out there at the same price range. Complex (with hidden flavours which indicates refill barrels). bananas (sweet as melted brown sugar), Ruby port, big Saltiness, Smokiness, Oak bitterness, citrus Peal, Pepper. smokiness, Bitterness, Hand rolling tobacco, Sweetness that reminds me of Pedro Ximenez, Soapy. 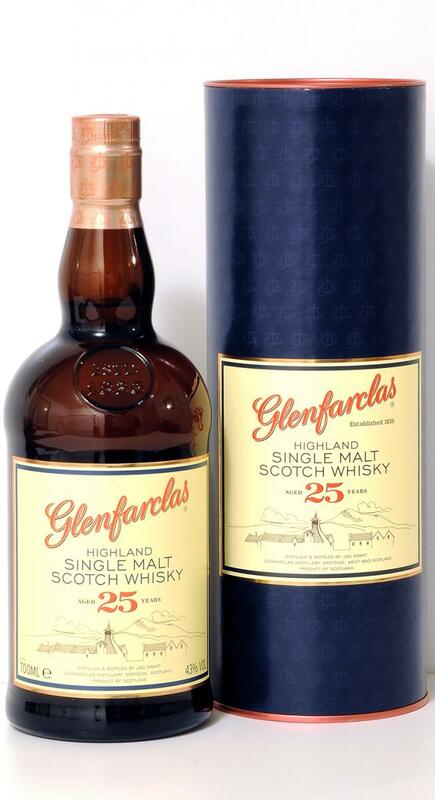 No topper for me, many better Glenfarclas varieties available. Also in the mouth apples, citrus and vanilla. Also a touch of chocolate with a little bit of herbs. Short warming finish with chocolate and spices. nosing this is pleasant, drinking is a kind of hard work, if you don't want to miss its qualities. it's obviously not an everyday-dram, but it's not a sunday's drink either. tertium non datur. so when to drink this? it needs at least half an hour to open up. fine oloroso, overripe apples, apple compote with raisins, apricot, peach, orange, even some grilled banana with rum, a collection of nuts, almonds, mainly peanuts, some nutmeg, a touch of honey, old leather, tobacco, cedar wood, a mix of coffee and cacao powder. the oak remains in the background, not dominating at all. the body is a bit thin. the first impression on the tongue is much more on the bitter side than expected after the rather fruity nose. pretty dry as well. feels a bit like sparkling. slowly you can detect all the scents in the taste as well. it's not an easy drinking malt. calling in your full concentration. medium length, some white pepper comes up, the wood enters the front. Tasted during a blind tasting competition in June 2015. Vanille, hout, hooiig/grastonen op de achtergrond; heeft iets van een alcoholpunch. Cremige textuur, romig, vanille komt sterk terug, kruidig, hinten van anijs. Met water erbij wordt ie wat scherper. Warme, middellange finish bovenin achterin verhemelte.